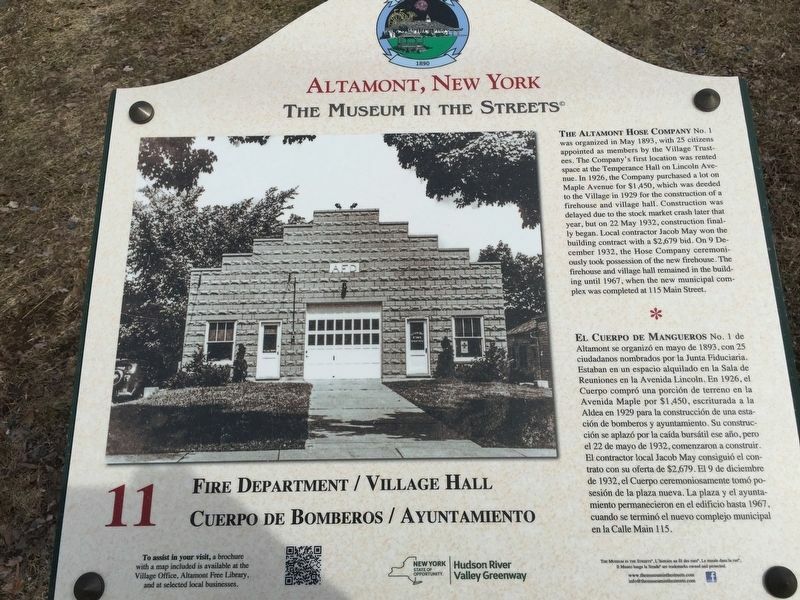 THE ALTAMONT HOSE COMPANY No. 1 was organized in May 1893, with 25 citizens appointed as members by the Village Trustees. The Company's first location was rented space at the Temperance Hall on Lincoln Avenue. In 1926, the Company purchased a lot on Maple Avenue for $1,450, which was deeded to the Village in 1929 for the construction of a firehouse and village hall. Construction was delayed due to the stock market crash later that year, but on 22 May 1932, construction finally began. Local contractor Jacob May won the building contract with a $2,679 bid. On 9 December 1932, the Hose Company ceremoniously took possession of the new firehouse. The firehouse and village hall remained in the building until 1967, when the new municipal complex was completed at 115 Main Street. EL CUERPO DE MANGUEROS No. 1 de Altamont se organizó en mayo de 1893, con 25 ciudadanos nombrados por la Junta Fiduciaria. Estaban en un espacio alquilado en la Sala de Reuniones en la Avenida Lincoln. En 1926, el Cuerpo compró una porción de terreno en la Avenida Maple por $1,450, escriturada a la Aldea en 1929 para la construcción de una estación de bomberos y ayuntamiento. Su construcción se aplazó por la caída bursátil ese año, pero el 22 de mayo de 1932, comenzaron a construir. El contractor local Jacob May consiguió el contrato con su oferta de $2,679. El 9 de diciembre de 1932, el Cuerpo ceremoniosamente tomó posesión de la plaza nueva. La plaza y el ayuntamiento permanecieron en el edificio hasta 1967, cuando se terminó el nuevo complejo municipal en la Calle Main 115. Location. 42° 42.143′ N, 74° 1.989′ W. Marker is in Altamont, New York, in Albany County. Marker is on Maple Avenue (New York State Route 146) when traveling west. Touch for map. Marker is in this post office area: Altamont NY 12009, United States of America. Touch for directions. Other nearby markers. At least 8 other markers are within walking distance of this marker. Enterprise Building (a few steps from this marker); Beebe Harness Shop (a few steps from this marker); The Great Fire (a few steps from this marker); The Carriage Works (within shouting distance of this marker); Lincoln Avenue School (within shouting distance of this marker); St. John’s Lutheran Church (about 400 feet away, measured in a direct line); Altamont (about 400 feet away); Orsini Park (about 400 feet away). Touch for a list and map of all markers in Altamont. More. Search the internet for Fire Department/Village Hall. Credits. This page was last revised on March 26, 2019. This page originally submitted on March 25, 2019, by Steve Stoessel of Niskayuna, New York. This page has been viewed 42 times since then. Photo 1. submitted on March 25, 2019, by Steve Stoessel of Niskayuna, New York. • Bill Pfingsten was the editor who published this page.